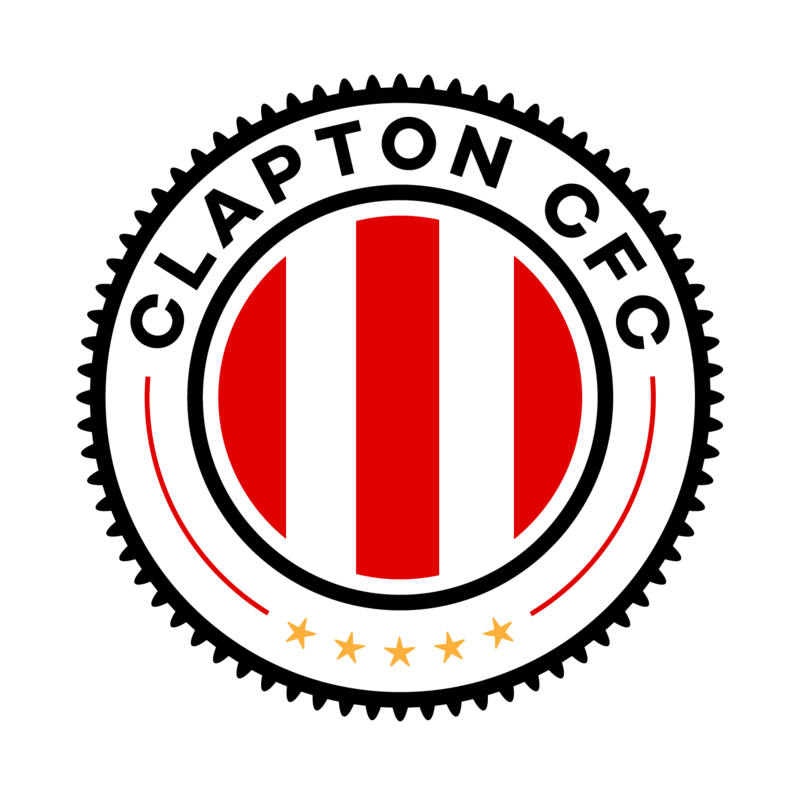 On July 22 2018, Clapton Community took on Holland FC in their first game. 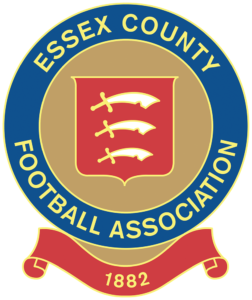 They were beaten 5-0 in that friendly on the Essex coast. 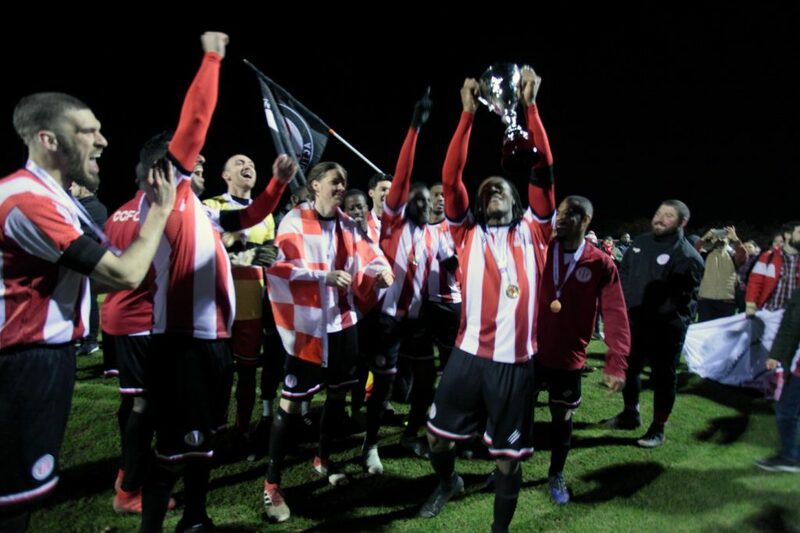 Less than nine months later, they have their hands on the first trophy of this new chapter of Clapton history. 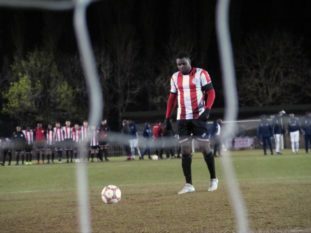 A nerve-shredding penalty shootout win over Hilltop FC at Uxbridge FC’s Honeycroft ground meant the Jim Rogers Cup was coming back to East London on one of the CCFC coaches. Geoff Ocran was able to welcome back first choice keeper Dan Anfossy, who had missed a couple of games when he was off on his hols. Ellick Coleman continued at right back. Tonight’s line-up for the Jim Rogers President’s Cup final. From the off, it was a very offsidey game. Hilltop’s strategy was to use their pace to spring the offside trap. They got flagged most of the time. The assistant referee will have woken up on Sunday morning with a strained arm. However, when the Middlesex Counties League West side did get their timing right, they were a terrifying prospect. The Tons defenders had to have their timing spot on to avoid giving away a penalty or being made fools of by their skilful opponents. Luckily, the centre back pairing of Yacine Rabia and Dean Bouho were absolutely at the top of their games. Clapton also looked to hit with quick counters. Jake Stevens and Josh Adejokun were flying down the wing at any opportunity. The Tons had more aerial threat. And they were doing crunchier tackles. This led to a few delays while Hilltop players lay on the ground recovering. The first clear-cut chance came after 24 minutes. A Hilltop cut-back across the box found an attacker in loads of space. But he was leaning back and skied it. A minute later, Adejokun rocketed down the right and drove the ball across goal. A Hilltop defender riskily turned it into the side-netting when he could easily have put it past his own keeper. On 32 minutes, lively Adejokun had a snapshot from inside the box. The Hilltop keeper fumbled, but it fell to a defender who was able to mop up. Right at the end of the half, Hilltop failed to properly clear a Clapton throw-in. They were pickpocketed and the ball fell to Eliot Crosbie in the box. He slotted into the bottom corner to break the deadlock. The players dashed after Crosbie to celebrate in front of the Tons faithful. Just before half time is the ideal time to grab a goal, right? Except Clapton were again struck by their bad habit of lapsing in concentration just after scoring. A mere minute later the defence were caught napping by a quick Hilltop throw. Ali Mohamed raced into the box and spanked it into the roof of the net over Anfossy for the equaliser. The second half got off to the worst possible start for the East Londoners. A low ball across the box had the Hilltoppers lining up to score. 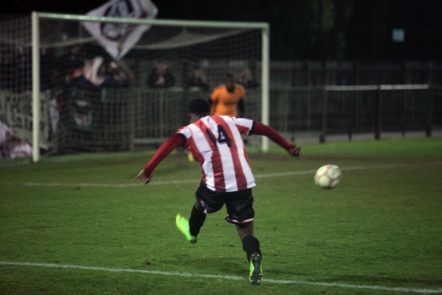 Ali Mohamed knocked in his second to give the Brent-based team the lead. But that advantage didn’t last long. On 55 minutes, Anfossy rolled a goal kick to Rabia. From the edge of his own box, the centre back launched an absolutely massive punt. Sherwin Stanley muscled past the Hilltop backline to collect. The striker then stabbed it away from the keeper’s desperate grasp to bring it to 2-2. Stefan Nielsen’s wicked corner deliveries continued to threaten. One was headed on to the top of the bar by a Hilltop defender. The resulting corner then found its way into the net. But the ref ordered a retake, for some mysterious reason. Twenty minutes into the second half, a tasty Hilltop free kick was well palmed away by Anfossy. Then Ocran managed to round the Hilltop goalie in a wide position, but couldn’t squeeze it into the net. On 75 minutes, a Hilltop player got through on goal. He tried the dink over Anfossy, but it landed on top of the bar and went over for a goal kick. Five minutes later they had a goal chalked off for offside as the play continued to swing from end to end. 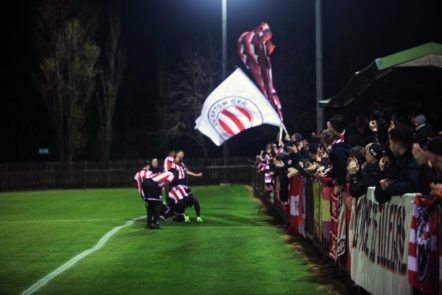 Some Clapton fans who were late back from half-time and missed Hilltop’s second goal were wondering why their team weren’t just shutting up shop. They thought they were 2-1 up. Finally, amid some late pressure from the Tons, the referee blew for full-time. Coming up to 10pm, fortunately there was no extra time scheduled. Straight to penalties. The Tons fans decamped to behind the goal to do their best at encouraging and distracting in equal measure. Stanley, Cemal Agdelen and Nielsen dispatched Clapton’s first three spot kicks beautifully. Hilltop smashed in two emphatically, but the third was shanked round the post. Stevens scored the next one. Hilltop made it 4-3, giving Rabia a chance to clinch the trophy for the Tons. He had been there before in this very competition. It was Rabia’s decisive penalty that eliminated London Samurai in the quarter final at the Stray Dog. Again, cool as ice, the defender thumped it high into the net to send the fans behind the goal into delirious celebration. Once the pitch invasion cleared, the supporters were ushered round to the main stand for the presentation. With perfect comedy timing, the floodlights cut out. 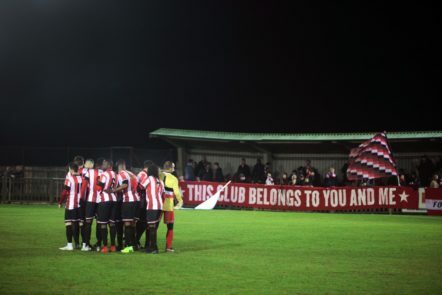 When they finally dropped a coin in the leccy meter and we could see again, the Clapton players raised the cup aloft. It was a symbol of all the hard work Ocran’s team and all the volunteers behind the scenes have put in to build the club up to where it is today. This victory was a joyous conclusion to an intense period for the Tons. Tough competitive games and international friendlies have come thick and fast. But the team have become more resilient. They lose goals. They fight to get back in the game. This will give them confidence to get a result against whatever opposition they come up against. With results in the league on Saturday also going Clapton’s way, the title race is now back in their hands. The Anagram Records Trophy final against Catholic United on May the 4th looms. Whatever happens from here, this season has been an unimaginable triumph. But could the Jim Rogers Cup just be the start of it? Eliot Crosbie sprayed some great passes around, roughed up the opposition, got a goal and did an iconic knee slide in front of the fans. Hard lines on Yacine Rabia, whose assist and winning penalty only got him third place. The public just don’t vote for defenders! Man of the match poll for Saturdays’s dramatic cup final win vs @fc_hilltop.